A surprisingly high percentage of our happiness and woe is dependent on the viewpoints through which we interpret our experience, views which are often not only unexamined, but also unrecognized. Operating invisibly, they become the source of further interpretations, conclusions and judgments we make about our experience, our selves, and others. When these underlying foundational views are unrecognized they can cast an aura of truth over these secondary interpretations, and therefore support a tendency to believe them unquestioningly. An important function of insight retreats is cultivating adequate calm and clarity to discover these underlying viewpoints influencing us, and to see them for what they are–provisional, conditional, and distinct from direct experience. This in turn helps us to hold all views lightly, without being under their sway. As the mind becomes calmer it becomes easier to discern which of our viewpoints are unnecessary and which are useful, which lead to distress and which lead to wellbeing, which interfere with the path of practice and which support it. Meditating on retreat is an effective means to shed unnecessary and/or detrimental views. As the mind quiets, we can discover an ease and peace not ruffled by interpretations that keep us at a distance from the immediacy of our experience. We can even learn that it is useful to let go of active involvement with beneficial views when these are not needed. A mind not active with views gives us access to insights and wellbeing often inaccessible in daily life. While meditating on retreat could be described as a continual shedding of the views, opinions, and stories on which we base our lives, there are conscious perspectives that support the deepening of meditation in particular circumstances. As long as these support the practice, they are useful to keep. When they no longer serve, they can be let go. These views can be pragmatic understandings supporting retreat practice, both views about “what to do” and “what not to do”. Beneficial views of “what not to do” include, for example, that it is useful to refrain from all unnecessary speech. It is also helpful to believe straining or tensing up in practicing mindfulness is counterproductive. A beneficial view is that it is unnecessary to be preoccupied with every negative judgment, even if there may be some truth to them; they probably have no usefulness in the meditative process. Beneficial views about “what to do” include ideas of which forms of meditation are useful, which purposes and intentions are supportive, and how to view experiences so that, rather than being distractions or problems, they are understood as the subjects of meditation. Because there are innumerable beneficial points of view, it is important to not over-rely on them. An overabundance of beneficial views can lead to a proliferation of thought that undermines the quieting of the discursive mind central to the deepening of meditation. When the mind is quiet enough, active thinking about beneficial understandings can be experienced as agitating and therefore unhelpful. It’s helpful to “keep it simple”. Any difficulty or unexpected challenge can give rise to reactivity and opinions which undermine the practice. One can interpret both internal experiences and external events as unfortunate, as obstacles, and as something that should not be happening. Even if there may be some truth to these interpretations, they are often self-verifying. That is, when we interpret something as an obstacle to mindfulness practice, it is the clinging to this interpretation that obstructs mindfulness, that seems to “prove” the thing is obstructing. 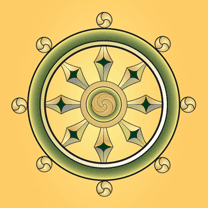 To support mindfulness and the path to liberation it is useful to view any difficulty or challenge as occurring appropriately, “right on time.” We can even imagine looking at a wristwatch while thinking “right on time!” This perspective is a reminder to take whatever “is happening” as the subject of mindfulness practice, not as a distraction from it. It is similar to adopting the perspective that “there are no mistakes on retreats”—there is only the next thing we include as part of the practice. To view each arising experience as simply the next thing to meet with mindfulness can lead to great equanimity. It is a view that provides a kind of infinite forgiveness for any personal foibles we may find ourselves engaging in on retreat; instead of lingering with self-recrimination, we dedicate ourselves to remaining in the flow of present moment awareness. This is an encouragement to avoid becoming preoccupied with what other retreatants are doing. Taking responsibility for other people’s retreat practice can easily interfere with one’s own practice. It may even interfere with theirs. The alternative is to remember that the task each retreatant has is to practice as wisely as possible with whatever arises on the retreat. Whether or how others assume this responsibility for themselves does not need to be our responsibility. In leaving each person responsible for their own practice we allow them to learn the lessons that they may uniquely need to learn. At the same time, we learn the ability to be free of preoccupation with other people, including being distracted from our own practice through preoccupation with others. Not taking responsibility for others is not the same as being aloof or indifferent. It can be seen as giving people freedom from our over-involvement and over-judgmentalism. It can also be seen as allowing people the opportunity to do the inner work that only they can do. Every person matures on the path of liberation by how they attend to their own inner life; on retreat, it is best to focus on attending to one’s own. If one is on retreat with a relative or friend, it is useful to discuss beforehand how to appropriately leave each person responsible for themselves. Not taking responsibility for how others practice doesn’t mean we need to be unconcerned with their welfare. I believe Buddhist practice reveals we are all deeply and mutually interconnected; we are all kin to each other. We can learn from one another, inspire one another, and realize how much the path of liberation is an interpersonal path as much as it is a personal one. When we engage in our practice, even if we believe we are doing it as a means to heal and resolve our own suffering and inner struggles, our practice does benefit others. On retreat, each person’s dedicated practice supports the practice of the group. Each person’s growth and transformation through the practice can inspire others to practice. Furthermore, each person’s resolution of their inner demons makes them a better member of our human family. People maturing on the Buddhist path mature ethically; they become refuges of safety for others. Knowing our practice benefits others even when we are not actively intending to do this can give added motivation to practice. Sometimes retreatants come to retreat with expectations of how they will practice, what issues they will be working on, and what will happen. Most commonly the retreat unfolds differently from what is expected. Unanticipated physical experiences appear; surprising emotions emerge; unforeseen concerns and memories loom large. Some of these unexpected phenomena may be unresolved issues which appear “right on time.” Some may be underlying thought patterns and emotional attitudes that, invisible in daily life, are revealed during retreat. And sometimes events at a retreat may evoke emotional reactions we hoped to avoid while on the retreat. Often people respond to these unexpected occurrences by becoming perturbed about why they appear and then spending time trying to understand why or to fix “the problem.” Or we might become discouraged when we can’t let them go or ignore them. Occasionally they might illicit fear, especially if we feel a loss of control or a fear about how things will unfold. We might interpret such occurrences as distractions from “real” practice. However, if they interrupt us from continuing in the moment-to-moment flow of mindfulness and concentration, we make these reactions the focus of attention. We don’t have to understand every physical and mental thing that happens to us during retreat. We don’t have to be in control of what arises within us as we practice. And we don’t have to see any of these as distractions. Instead we can trust that these are all things that are appropriate to include in the practice. To accept everything as equally appropriate for our mindfulness allows the practice to touch all of who we are. It helps ferret out all the areas the practice needs to address if we are truly to discover the inner freedom of the Buddhist path. The issues we face on retreat arise because of causes and conditions. We do not need to know what these causes and conditions are in order to practice with what arises. If we view them as appropriate it can be easier to include them as part of the practice; it is as if something in our subconscious or something about how the practice unfolds “knows” what needs to happen next. I like to think of this as “the Dharma knows best” what should occur. We don’t have to understand “why” something is happening, we only need to be mindful of what is happening, including our reactions to it. It is in transforming our reactions into responses of equanimity, non-clinging, and compassion that the practice comes alive. As the practice allows us to experience our potential for ease, peace, and kindness, we become increasingly sensitive to how the views we form affect our well-being. While some views may distance us from this potential, others may be in harmony with it, perhaps even arising from the vision this ease, peace and kindness provide us. It is useful to remember the understandings that come from this inner vision. Perhaps some of the aphorisms offered in this essay may be useful. And at times, when the vision of freedom and kindness is clear enough, we don’t even need positive views, we only need to see clearly.